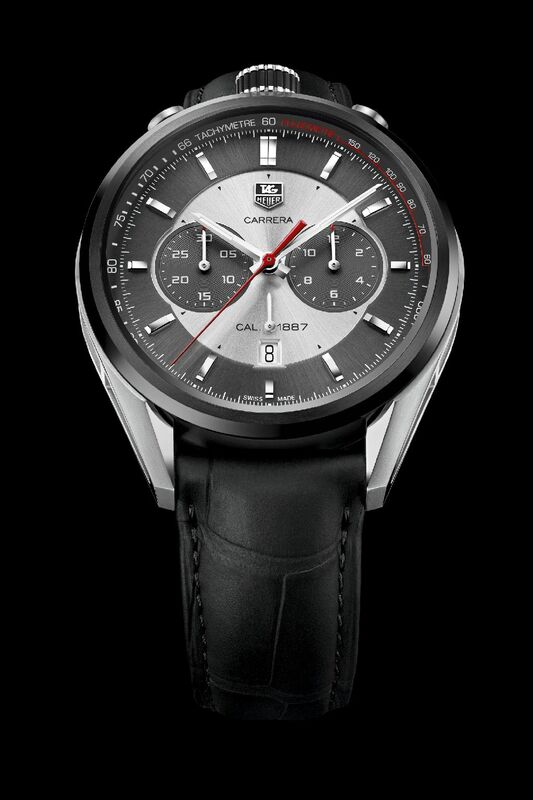 This model is a stunning tribute to the CARRERA’s creator, TAG Heuer Honorary Chairman Jack Heuer. Like the CMC Concept Chronograph, the asymmetrical case design comes from the Carrera Mikrogirder, and the technical details from Formula One and aeronautics: black titanium carbide steel in the 45mm case, hand-brushed and polished to a high sheen; polished, a fine brushed and sandblasted steel cage; tachymetre and pulsometre on the dial. Jack Heuer’s coat of arms and signature decorate the smoked sapphire caseback, through which can be seen the audacious 39-jewel Calibre 1887 movement. The CARRERA Calibre 1887 “Jack Heuer” Chronograph (45mm) is based on MIKROGIRDER 10’000 , DESIGN winner of the prestigious “Aiguille d’or ” at Grand Prix d’Horlogerie de Genève 2012.